"I'm against having a king,"
Having another TP moment are we? First he's a Muslim, a socialist, a N-, a Kenyan, a marxist and now a king. Have I missed anything? This is yet another effort to stir up racist white people who hate him anyway. The president is not trying to take anything away from you, including your ignorance he's just trying to do what the American people asked him to do LEAD and TRY TO KEEP US SAFE. What a hateful buch of troublemakers they are, and I wish all of them would just move away and take their guns with them. So let me get this straight. If the President issues an executive order because Congress is too chicken poop to act, then he's some sort of dictator? Give me a break. And suggesting that our President is other than the Chief Executive of this country on foreign land, ally or not, is beyond the pale. You simple minded twit. Executive order are simply directed at how existing laws are carried out. The scope of the how is defined by law and the executive branch fills in the blanks within that scope. So all that is happening here is that the executive branch is deciding how to go about enforcing existing laws that Congress has passed. I know Paul is not so stupid as to not understand that, so I have to presume he is simply another demagouge, purposely misleading his sheep. Sounds more like a King than what Obama is doing. Well, I'm against having idiots in congress but we have Rand Paul, the King of idiots. So, where does that get us? It's like they live in a cartoon world. There are plenty of things that fall squarely within the authority of the executive that Obama can, and likely will, be doing to enhance gun safety. Nothing says "reational, realistic governance" like pretending someone's trying to do something that there is absolutely ZERO evidence of him trying to do. Of course, if journalism wasn't 100% dead and buried in this country, we'd have journalists correcting his demagoguery accusations and pointing out that they are, indeed, entirely baseless and substanceless. But alas, the advertising industry entirelyk controls what the "news" industry is allowed to report as "truth." Ergo, Randroid gets a free pass on standing up and pretending Obama wants to "ban all guns and take all your guns away" despite Obama never saying that, never threatening that and never giving any indication that he believes he has the authority to do so uniltarally as executive. It doesn't really matter what any representative from the Tea Party says or thinks. No one takes them seriously anymore...no one but themselves, that is. Last time I checked, the President expanded gun laws by allowing people to carry concealed guns in national parks. 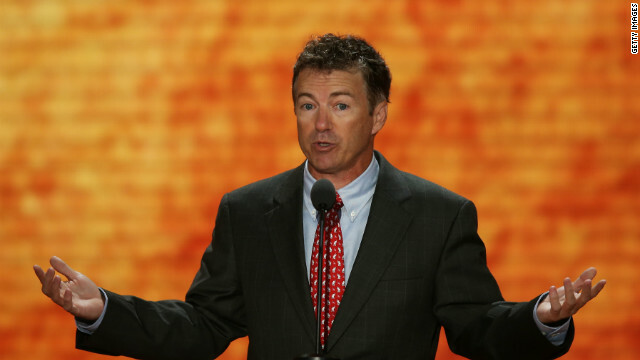 "Well, I'm against having idiots in congress but we have Rand Paul, the King of idiots. So, where does that get us?" Where? Entirely lost about halfway between Crazytown and Derpsville with only Appe Maps to help find our way home. "No one takes them seriously anymore"
That's not true. CNN and the rest of the MSM takes them seriously. They are god's gift to lazy, research-less, 24-hour-news-cycle, fact-avoiding gossip reporting and controvery manufacture. Kentucky come on. Not one, but 2 worthless senators. Really? It is time for American people to start electing citizens with reasonable consciousness. are these tools incapable of talking without insane hyperbole? Who is more shameful? The person who said this? Or the one who blindly supports him? "I think having a monarch is what we fought the American Revolution over", sounds exactly like the psycho who was interviewed on CNN and called out the interviewer to have a round or two, boxing with him. No shortage of idiots in your wonderful country. G-d Bless America. No matter how many times the crazies rear their heads, I still can't get used to it. They make a good case for why the paranoid and delusional shouldn't skip their meds. These guys have all kinds of names for this president. Yet they fail to see themselves consistently being obstructionists. Obama has the lowest number of executive orders of, what, the last 10 presidents? What power does a president have if they can't give an executive order? A King who just got re-elecetd with a huge margin, and has a 52.% job approval rating. Meanwhile, I believe bedbugs are more popular than Congressional Republicans. This stuff might play on FOX, but over here in reality... not so much.